Italian cucumbers are divided into two categories: the regular types popular for salads and pickles; and what is called a melon cucumber. Melon cucumbers taste like regular cukes when picked small but as they get larger, they turn yellow and taste sweeter. If you have never grown melon cucumbers, we suggest you try one alongside the regular type and see which you like better. Melon cucumber varieties (The Italian on the front of the seed packet is Cetriolo Melone) include: Half Long of Puglia; Tondo di Manduria; and Tortarello Barese. Culture. Growing advice is the same for both types of cucumbers. Cucumbers like a loose, well-drained and fertile soil. You can either direct seed or use transplants if you are careful not to disturb the roots. 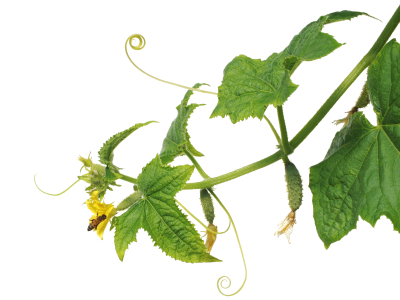 Cucumbers should be grown on a trellis or other support to prevent the fruits from bending or curling. Cucumbers are heat lovers and should not be started until two or three weeks after your last frost date and when the soil temperature has warmed up to at least 70°F. If direct seeding, place 2-3 seeds every 12 inches, and later thin to one plant. For transplants, put 2-3 seeds in a 2-inch pot or 50-cell plug tray and thin to one plant per unit. Start transplants three weeks before set out date. Carefully transplant, taking care not to disturb the roots. Because cucumbers need warmth to germinate and grow well, they are often grown on black plastic mulch and covered with row cover. Water. Consistent soil moisture is needed for cucumbers to yield well and taste good. They are mostly water, and need a steady supply of water to produce smooth, uniform, non-bitter fruits. Diseases and pests. The bane of cucumber growers is the cucumber beetle. They can seriously defoliate young plants and they spread a bacterial wilt which usually kills the plants quickly. The best prevention is to cover young plants with row cover for the first few weeks; remove it when they flower and hand pick any remaining cucumber beetles until their numbers naturally decrease as the weather gets hot. It is a good idea to make a second planting about four or five weeks after the first. That way if you have problems with the first crop, you can still have cucumbers. Try not to touch the leaves when they are wet from morning dew or after a rain because it encourages the spread of disease. The variety White Wonder, called Bianco Primaticcio in Italy, is reputed to have some resistance to the bacterial wilt spread by cucumber beetles. Harvest, storage and use. Pick cucumbers every day. Do not allow them to get large and develop seeds, since this will stop or slow future production. Look carefully since it is easy to miss one, which will inhibit the growth of new flowers and fruits. Store in a refrigerator in the crisper section. For pickling, choose a small, firm cucumber such as Piccolo di Parigi or White Wonder.